My cultural experiences from last week covered quite a range: Thursday, I went to the Henry at UW to see the Maya Lin exhibit “Systematic Landscapes”; Saturday, I saw Jesus is Magic. Both were excellent. I have but one box remaining in my living room, which will be unpacked when I find a little more room in my kitchen for cookbooks and a few odd pots and pans. Unpacked in a month? I’m quite pleased. Played this weekend at Spawnfest up in Burlington. Highlights included good weather, swimming in the Skagit, excellent bagels and good frisbee. I did get clobbered on Saturday, so I didn’t play Sunday, but that didn’t stop me from hanging out, eating more bagels, swimming & heckling. The condo is coming along and feeling more and more like home. I ordered some blinds for my bedroom windows, and I’m realizing the living room and kitchen windows probably need some sort of treatment as well. The sunlight in the evenings is pretty overwhelming, and also heats the place up pretty significantly. More blinds, or should I go curtains? These are the tough decisions in life. Got a bunch of stuff done around the condo this weekend – fixed a leaky toilet valve, installed doorstops, unpacked some more, and painted the living room ceiling. Plenty still left to do, though. Also, I took a few pictures of the place (though they’re not the best), and put them up here. As of today, I’ve lived in Seattle officially for 1 year and 1 week. Though I don’t feel particularly settled right this second, that has much more to do with my recent move than any unhappiness in the city. I’ve really been enjoying myself here: found a great job, taken advantage of the surroundings, bought a condo, and have met tons of people. That’s me in yellow, and most everyone I know in town. People who don’t live here but have connected me to friends in Seattle are shaded in gray; activites (like swing dancing) and organizations (like a frisbee team) are in boxes. 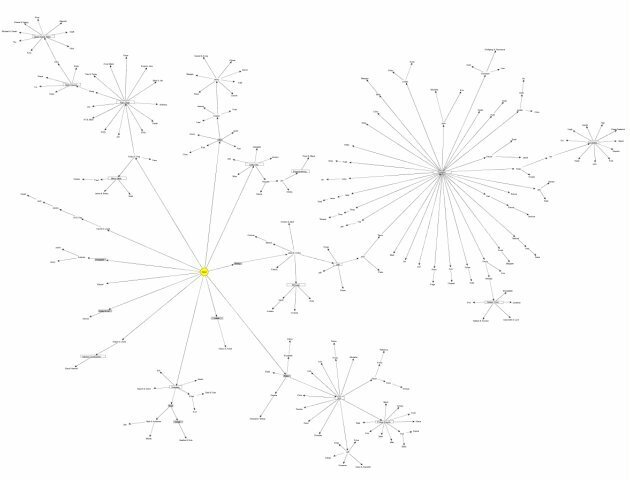 There are 230+ nodes on the graph! I haven’t tried to link this to Palm Desktop or include any meta-information (like contact info or any notes about a person), but yEd seems to have some provisions for that kind of thing. The graph doesn’t necessarily help figure out how I should network in the future – some very fruitful connections go through people I don’t know well at all, some people I would have thought to be well-networked haven’t been, and vice versa. But, it is fascinating that each line is a story (or several), and it’s a nice way to remember it all. I’m gonna try keeping this up-to-date – it’s a fun experiment. On the front of the juice bottle: “100% Juice”. The ingredients list: “Filtered water, white grape juice concentrate, ruby red grapefruit juice concentrate, apple juice concentrate, pectin, ascorbic acid (vitamin C), carmine (color), citric acid and other natural flavor.” What gives?